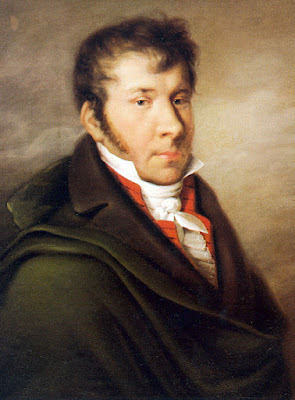 Johann Nepomuk Hummel was an Austrian composer and virtuoso pianist during the classical era of music. He was a child prodigy as a pianist and was even taught by the great Mozart himself at a young age. Mozart recognized this child's potential. Hummel may have had a funny name but his compositions were no joke. He had some great compositions mostly for the piano with great sonatas, etudes and concertos. But, unlike Chopin who wrote almost exclusively for solo piano, Hummel had many compositions that used other instruments besides the piano. Hummel also had, what in my opinion, was one of the best trumpet concertos in that era. Along with the Haydn trumpet concerto, the Hummel concerto in Eb Major is one of my favorites, especially I love its exciting third movement, rondo. While many of his works follow the quintessential Mozart classical style, Hummel's piano concerto in A minor could be said to be a precursor to the Romantic era. To represent just a small sample of some of the great compositions of Hummel, I have the third movement of the two pieces I named above plus a great piece for two pianos, his introduction and rondo in Eb Major and one of his many wonderful sonatas, this one for cello and piano in A Major and also the dramatic finale of his piano concerto in B minor. If you've never heard the name of Johann Nepomuk Hummel before, I think when you hear this music you will see you can't judge a composer by his name. While Hummel wasn't prolific in his compositions, what he did compose, mostly for the piano, was very good. Please turn up the volume and listen to these works of Johann Nepomuk Hummel. Wonder how many women are great artists of the trumpet, seems like thats a male dominated instrument!! Fun piece! I agree Brad,it does seem like it would be a male dominated instrument, but this proves it is not a male only instrument. Thanks bro! Wonderful! This posting was a pleasant and informative surprise-thanks Big Mike! Thank you very much Andrew. I appreciate it! So while it's true that the people make an event (and the people definitely made any event!) this space definitely adds a different dimension to it. Went to Los Angeles venues here for an evening event and I was really impressed.